Mumbai, Oct 1 (IANS) The team of Bollywood film “Mary Kom” — director Omung Kumar and actress Priyanka Chopra — have lauded their movie’s inspiration, Indian boxer M.C. 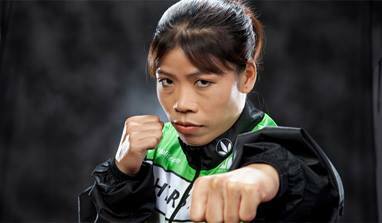 Mary Kom, for winning India’s first women’s boxing gold in Asian Games Wednesday. Mary Kom punched her way to victory, defeating Kazakhstan’s Zhaina Shekerbekova in the flyweight (48-51kg) final in Incheon Wednesday. The National Award-winning actress, who had tweeted a congratulatory message for the star boxer immediately after her victory, said she is “privileged and proud to have been able to tell this amazing woman’s story to the world”. “Having literally been in her shoes, I truly understand the hard work and sacrifices she has had to endure. She truly is a ‘Ziddi dil’,” Priyanka said. Omung, who made his directorial debut with the Bollywood project, said he is proud of “our true hero Mary Kom”. “She has done the whole country proud. The whole team of ‘Mary Kom’ film was praying for this win, and Mary has proved that if you have zidd (you are adamant) in your heart, you could achieve anything,” he added.